This past week we have walked the beach till we look like crayfish, climbed a lighthouse - all 178 steps up and 178 steps down!, picked up coral and shells, cycled all over Tybee Island and toured Savannah by horse drawn carraige, just to mention a few things......... and cml has finally taken a backseat in my mind for a good few days. This does not mean that I have not thought of it, I have. I have realized that to not think of cml would be abnormal - its now firmly part of my life, as much as Steven is a part of my life. It's really good to see that a mere year after Steven's diagnosis, I am dealing with it all in a much better way than before - it feels healthier and so much easier on me and everyone around me. I know that this is able to happen because Steven is reacting so well to the meds, and I treasure every day without a cml wobble. 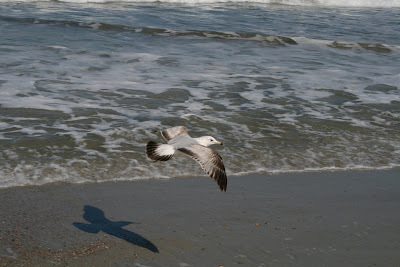 Walking on the beach I watched a seagull hanging in the wind, just a foot above the sand and thought of all of those with cml and all their caregivers - just hang in there! Hang in there, the wind will pick up and we will glide again........ I saw a big bubble in the surf and could see the shells through that bubble as well as all the other shells and it made me think of how we sometimes see life - through a bubble without seeing the full picture. Tomorrow we will walk the beach again, find more coral and I will get even stronger in my resolve to live with cml in my kid and in my life. I will get stronger in my resolve to be stronger for Steven, I will get stronger in my resolve to be the very best I can be and, oh please God! - to learn how to find the strength to find patience while waiting for those flippin PCR results!! It's wonderful to see in nature, the lessons I can use in my life to get stronger, to hang in there and to see more than just that bubble we all live in at times......... There is another one that made me think of this all....... there is a pole on the beach that has barnacles growing up it to the high water mark. This pole had barnacles as high as I am short! All 5.4ft! So here are these tiny little barnacles in this enormous ocean, finding a narrow little pole to cling to, but then the water is swept from under their feet............ and they cling tightly way up in their sky, hoping like heck that the seagulls don't get them or the sun does not bake them dry, waiting for the water to come back and give them what they need again......... And the water always comes back. annie, thank you for your nice comments in my blog. it made me so proud to read what you wrote about my poem and it would be totally ok to share it with others really. lots of love and strength to you and your son.